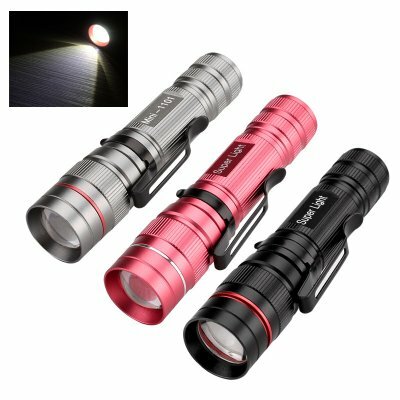 Successfully Added Three CREE T5 LED Flashlights - Up To 300 Lumen, Pen Clip, Adjustable Focus, 3 Modes, Anodized Finish to your Shopping Cart. Containing not one, or two but three pocket flashlights ensures you will have a LED light for all occasions. Each none of these compact, durable, and versatile flashlights is powered by an AA battery or can fit a 14500 rechargeable battery (not included). With CREE T5 LEDs each one of these pocket torches can provide up to 300 lumens of light, they are the perfect size to slip into your shirt pocket and with a weight of just 41 grams they won't weigh you down. Coming in a pack of three this stylish red, black and silver flashlights will be your go to light when you want to pack light. These compact lightweight torches have been anodized in an electrochemical process that has covered their aluminum body's in a protective and durable and corrosion resistant anodic oxide finish. With an adjustable focus and three lighting modes you can hone the light on a desired target or spread it over a wider area depending on your needs. This 3 Pack of Cree T5 LED flashlights comes with a 12 months warranty, brought to you by the leader in electronic devices as well as wholesale LED Flashlights and gadgets.. Handy to have around, and with 3, I can put them where I am likely to need one.